Honda is giving its fifth-generation CR-V more space, horsepower, refinement, fuel efficiency and safety features for 2017, a top-to-bottom remake of the segment-leading crossover that echoes the Civic’s transformation last year. The connection is no coincidence. The 2017 CR-V rides on the same modular platform as the Civic and shares most of its powertrain elements, including a turbocharged engine on higher trim levels. Anticipating growing volume, Honda said it has tooled its Greensburg, Ind., factory to start producing the CR-V, along with the current production sites in Alliston, Ont., and East Liberty, Ohio. The added capacity gives Honda more flexibility to meet demand in a U.S. market that’s fast shifting from cars to crossovers and other utility vehicles. The stakes for Honda to get the new CR-V right are high. The crossover has long been one of Honda’s most important -- and best-selling -- models, alongside the Civic and the Accord, and it leads a segment in the United States that is crowded with formidable competitors from Toyota, Nissan, Ford, Chevrolet and Subaru. Since its introduction in 1997, Honda has sold more than 3.8 million CR-Vs in the United States alone, making it the best-selling utility vehicle in the past 20 years, according to the automaker. 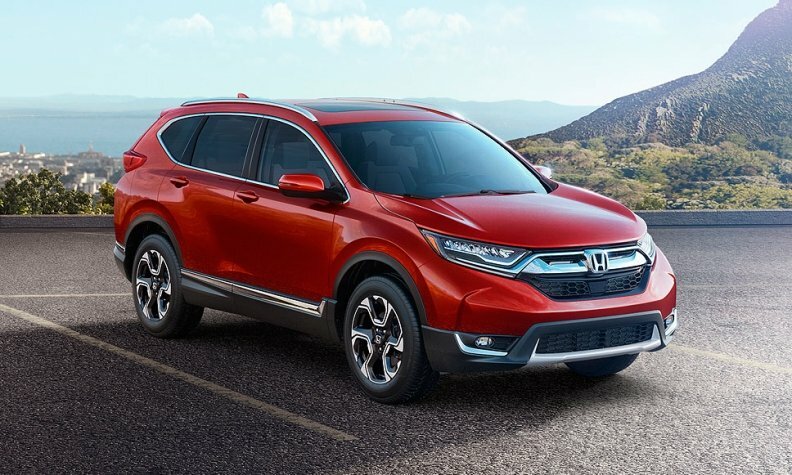 “Over four generations, CR-V has become a true staple of the American SUV diet,” John Mendel, executive vice president of the American Honda Motor, told reporters at a media presentation in Detroit on Wednesday. The CR-V was last redesigned for the 2012 model year, and got a refresh in late 2014. Despite its age, it has emerged as Honda’s top-selling vehicle in the United States this year, with 263,943 sales through September, beating the also aging Accord and trailing the Civic by about 20,000 sales. Last year, the CR-V was Honda’s No. 2 seller, at 345,647 units, trailing the Accord by about 10,000 units. Honda sold 38,961 of them in Canada in 2015. Only the Toyota Rav4 and Ford Escape outsold the CR-V in the small crossover segment in Canada. Canadian sales of the CR-V through September 2016 are better than they were a year ago through the same time period. So far, Honda has sold 33,931, up from the 29,928 it sold in 2015. Like the recent Civic, the 2017 CR-V will turn to turbocharging for improved power and fuel economy: the top three trim levels (EX, EX-L and Touring) will now come standard with Honda’s direct-injected 1.5-litre turbocharged four-cylinder engine that makes 190 horsepower and 179 pound-feet of torque. Honda didn’t release EPA figures but it promised the turbo engine in the higher trims will give the CR-V the highest fuel-economy numbers among non-hybrids in the compact CUV class. Those higher trims make up about 75 per cent of all CR-V sales, Honda said. The base LX model soldiers on with a 2.4-litre four-cylinder engine that makes 184 horsepower and 180 pound-feet of torque. All 2017 CR-V models come with a continuously variable transmission and front wheel drive. All-wheel drive is available as an option. Inside, the CR-V benefits from many of the refinement upgrades that have brought the current Civic industry accolades and record sales. Honda added more soft-touch materials to the cabin and -- noting the frustrations of new Civic and HR-V owners -- restored the physical volume knob for the radio and buttons for the fan speed. “Our customers and many of you told us loud and clear that you wanted a volume knob, so the knob is back,” Jeff Conrad, senior vice president of the Honda division, said at the media event in Detroit. All trims but the base LX will come standard with Honda Sensing, a suite of safety features that includes collision-mitigating braking, forward collision warning, lane departure warning, adaptive cruise control and lane-keep assist. The crossover shares a modular chassis with the recent Civic as well as the next-generation Accord set to debut in 2017. The CR-V wheelbase grows by four centimetres and the length is up just over 2.5 cm. Passenger volume is up by nearly 0.05 cubic metres, as is rear cargo room. Rear legroom grows by five cm. Despite the growth, curb weight is down slightly from the earlier model. The outside styling gets a healthy makeover as well. Honda ditched the previous model’s curves for a more mature, edgy look. The new design language bears a passing resemblance to the Civic, particularly with the multi-layer grille, and standard LED taillights flank the rear glass. A hands-free, foot-activated tailgate will be an option, as will LED headlights. Pricing will be announced closer to the CR-V’s on-sale date later this fall. It’s not expected to change much from the current model, which starts at C$26,290 and US$24,745 for a base 2WD LX.